I whipped this out in about 1.5 hours last night while watching TV. It was easy, fast and I like it. I used a pint jam jar and baby sport yarn with this pattern: Mason Jar Cover. I just may make some more out of size 3 cotton thread for luminaries. So pretty and I love the color. I agree that it is very pretty! It really dresses up the jar and makes it useful. Pretty and practical two of my favorite things. I been thinking about that couple times..But I never crochet anything for my self. Couple times I left something for me and little later give that away. Thank you for such nice comments. Such an easy pattern and whips up quickly. 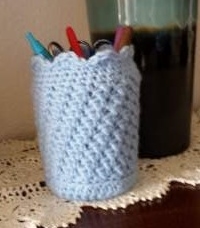 I know I should make some kind a cover for my hook holder (jelly jar) LOL I been thinking about that couple times..But I never crochet anything for my self. Couple times I left something for me and little later give that away. Krys- Thank you for the sweet compliment. I used to do exactly the same thing, but lately ,I realized it's time to be kind to me too. Must be old age setting in- LOL! So be kind to yourself too once in awhile and feel good about it. Great way to jazz up a old jam jar to use as a holder of many differnt things ie artist paint brushes, crochet hooks, pens, pencils etc makes a great desk tidy. Jar cosies are so satisfying to make. They take very little time, look beautiful and you are recycling at the same time.